With our new building’s construction well underway, we thought it would be fun to walk down memory lane and compare a few Glasscock School milestones from then and now. 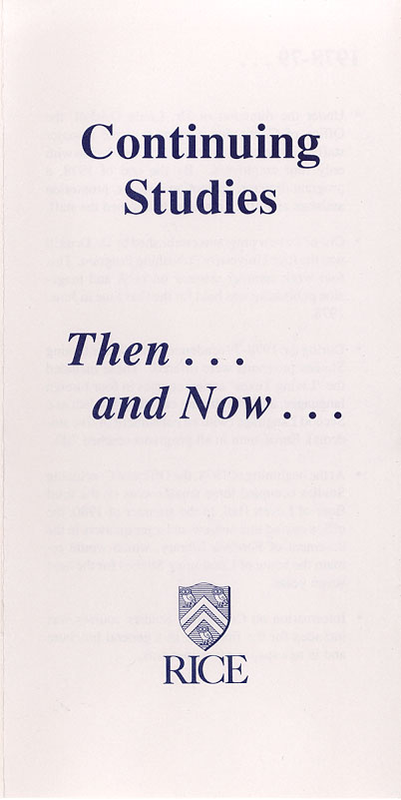 In 1978-79, Continuing Studies offered 48 courses with 700 enrollments. A decade later, the Office of Continuing Studies offered its largest selection of courses to date—more than 200 courses in the arts, humanities, sciences and professional development. Enrollment reached 8,000 for the first time. Today, the Glasscock School of Continuing Studies offers more than 240 personal and professional development courses and, not to mention, hundreds of other courses in our six other program areas, totaling nearly 20,000 enrollments. The Glasscock School would not be where it is today without its hardworking employees. 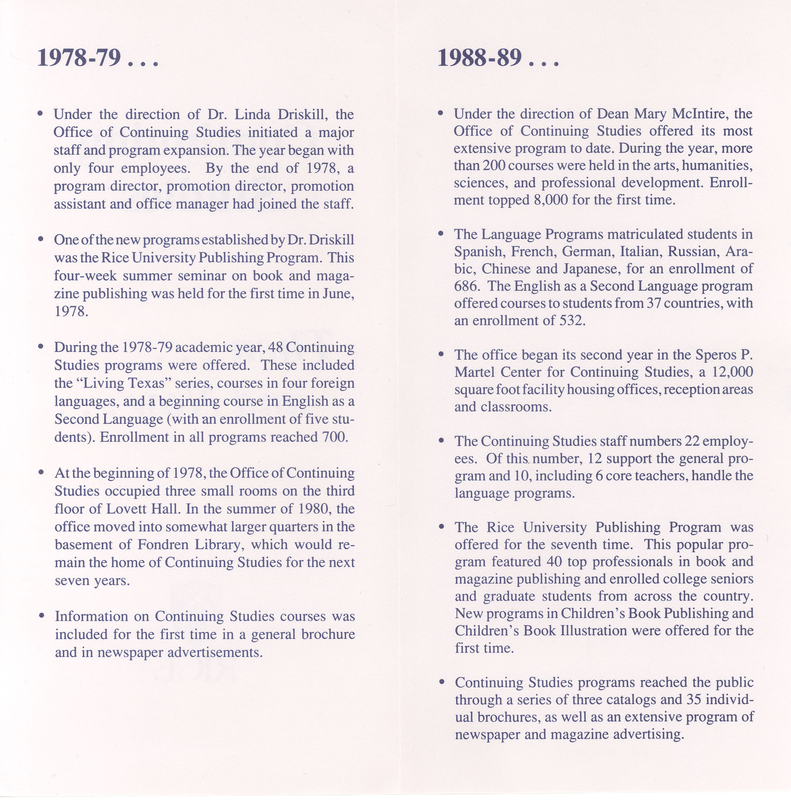 In 1978, the Office of Continuing Studies began with only four employees, but five more joined the staff by the end of the year. In 1988-89, the School had 22 employees. Today, we have more than 50 employees who keep this ship sailing. In 1978, the Office of Continuing Studies occupied three small rooms on the third floor of Lovett Hall. In the summer of 1980, the office set up shop in the basement of Fondren Library. Seven years later, the Glasscock School moved into the Speros P. Martel Center—a 12,000-square-foot facility—where we’d call home for the next 26 years. In December 2012, the Glasscock School broke ground on its new building, the D. Kent and Linda C. Anderson and Robert L. and Jean T. Clarke Center. 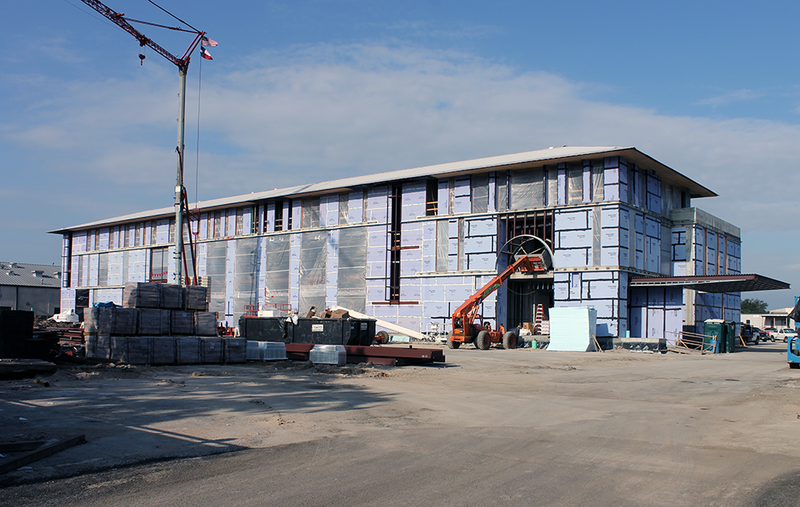 The 53,000-square-foot facility will open its doors in 2014. We are thrilled for what the future has in store, but we will never forget the past that helped us get to where we are today. Thank you to everyone who has supported us along the way!